Little Farm in the Foothills: Apple Pest (yet another one of the Devil's Spawn) Plus a Free ebook! Apple Pest (yet another one of the Devil's Spawn) Plus a Free ebook! When the wildfire smoke finally cleared, it was time to harvest our champion apple tree, the Akane. This is the one tree that faithfully bears every year, with beautiful fruit and great flavor and crunch, and no whining, sniveling or apple scab! So John and I ventured to our orchard with several big boxes and started picking, already tasting our homemade applesauce and apple crisp. However, for the first time in the 8 years of bearing, the fruit was covered with little dots, with sort of dimples all over the apple. Well, growing without spray, John and I are accustomed to less than pretty apples, so we figured no problemo. I was so ready for my first taste of the season, so I washed an apple and cut it in half to share with John. I could feel the apple's crunchiness as I wielded my knife, but as the apple fell into two halves, my heart sank. The middle was full of trails of reddish-brown stuff. Thanks to Ciscoe Morris, gardening columnist for The Seattle Times, I knew what I was looking at. Those of you who have read Little Farm in the Foothills know what I mean when I write "stuff" in italics. For the uninitiated, stuff in this sense means poo. To be precise, coddling moth poo. Orchard pros call it "frass" but why put lipstick on a pig, I ask you? For some reason, I thought coddling moths wouldn't find Berryridge Farm (the same hope I'd entertained about cabbage moths but was destined for disappointment). Anyway, we ended up giving the crop to my sister who has 3 horses, who don't care if their snacks are frass-filled. I'm not sure what we'll do about next year's crop--we won't spray, and while I've read about securing a plastic bag around each apple, that seems extremely high maintenance. Not exactly our style, so I'll keep you posted. In the meantime, we have 3 huge honeycrisp apples on one of our baby trees, and so far I don't see any dots. John and I will have to draw straws as to who gets the third apple! Free ebook at www.susancolleenbrowne.com ! 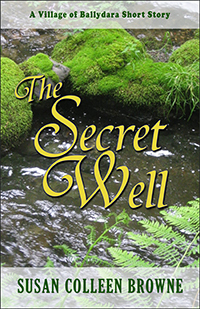 On a positive note, I wanted to share my redesigned web site, www.susancolleenbrowne.com, where you can find a special offer: a free copy of my short story The Secret Well, part of my Irish Village of Ballydara series...I hope you'll take a look!